Islantilla Golf Resort is situated just 800m from the beach and the rolling waves of the Atlantic Ocean of Costa del la Luz. The resort includes 27 holes of Championship golf which played host to the 1995 Turespaña Masters won by a young Alex Cejka! The course is surrounded by leafy vegetation and impressive ocean views. Accommodation at the Islantilla Golf Resort comprises 97 Doubles, 88 Junior Suites, 7 Senior Suites and 12 Duplex Bungalows. Guests can enjoy a buffet restaurant, a la carte restaurant, English pub and a bar and grill on the terrace by the outdoor swimming pool. Those wishing to unwind at the Islantilla Golf Resort can do so in the luxurious Beauty Farm, which includes a swimming pool with Jacuzzi, massages, Turkish baths, hydro-massage showers, hairdressers and a gym. A private Beach Club on Islantilla’s golden sands has its own swimming pool, terrace, bar and restaurant. It also offers watersports, while those keen for adventure on the high seas can visit the Islantilla Golf Resort’s own sailing club run by Fernando Serra Lalaurie, the 1993 Spanish Windsurfing Champion. A free mini-train connects the hotel and beach club. The Islantilla Golf Resort is just 50km for Faro Airport in Portugal, 118km from Seville Airport and 180km from Jerez Aiport. 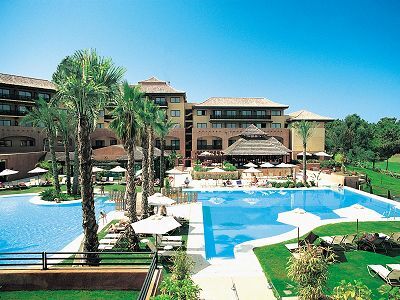 Ascot Golf Packages at The Islantilla Golf Resort Hotel include Half Board as standard. Half Board includes Daily Breakfast & Evening Dinner. Listed Package Prices: Listed golf package prices apply with Half Board. Listed Golf Package prices at Islantilla Resort include Standard Room, Half Board + Golf. - Unlimited Golf included for all packages - Stay 7 Nights, Receive 7 days Unlimited Golf! Offer Conditions: Offer must be booked by July 31. FREE Car Rental may be combined with FREE Drinks with Dinner for Groups. Listed Golf Package prices at Islantilla include Half Board meal plan with Daily breakfast & Evening dinner. Groups of 8+ golfers receive a FREE Drinks upgrade to allow for House Wines, Beer, Soft Drinks & Water with Evening Dinner each day. Listed Package Prices: Listed golf package prices apply with FREE Drinks for Groups. Golf Packages at Islantilla allow for Unlimited Golf on the day of play at Islantilla Golf Course. 18 Holes may be prebooked with additional golf to be booked directly at the resort FREE of charge. Golf Packages for May 1-June 30, 2019 at Islantilla include Unlimited Golf on each day. Book a 7 Nights/5 Round package, play golf at Islantilla on all 7 days with no extra charge! Listed Package Prices: Listed Golf Package prices apply with FREE replay on day of play. 204 rooms (97 Doubles, 88 Junior Suites, 7 Senior Suites and 12 Duplex Bungalows). Double room: 27m² with bathroom, hairdryer, telephone, internet, safe, air conditioning, mini-bar, balcony or terrace. Maximum occupancy 2 adults. Junior Suite: 36m² with the same fittings as the double room. Maximum occupancy two adults and child (2–12 years old). Senior Suite: 41m², divided into a living room, bathroom, bedroom and large terrace, with the same fittings as the other rooms. Maximum occupancy two adults and one child. Duplex Bungalows: Located in 6 individual villas, 71 m², divided into a living room, two full bathrooms, two bedrooms and a large terrace, with the same fittings as the other rooms. Maximum occupancy four adults and one child. The luxurious spa includes a beauty salon, hairdressers, Turkish baths, massage, hydro-massage spa, pool with Jacuzzi and gym. Beach Club: Located 900 metres from the Hotel on the same beach: bar, restaurant, swimming pool, hammocks, sun shades, sailing and sea sports school. Connected with the hotel by the mini-train, which is free and exclusively for guests. Sailing School: Fernando Serra Lalaurie, is the director of the Sailing School, at the age of 36 years, he is a training instructor for the Spanish Royal Federation of Sailing (“Real Federación Española de Vela”) in dinghy sailing, windsurfing and kite surfing. He was Spanish Windsurfing champion in 1993 and a member of the National Windsurfing Team for eight seasons. He has more than 26 years of experience in the world of sailing and has spent 17 years dedicated to teaching. Moreover, he is an expert in life-saving and also a pleasure boating skipper. Guests can also enjoy paddle tennis courts and mountain biking. Islantilla is a town in Huelva, Andalucia, on the Costa de la Luz. The area is known for its wonderful beaches, which have received the Blue Flag award. It is just 19km from the Portuguese border in an area also known as the Spanish Algarve. Islantilla is just 30km from the city of Huelva, which has Roman remains. There are many historic sites relating to famed explorer Christopher Columbus in the area including the Rábida Monastery where the Franciscan brothers helped Columbus find funding for his journey to the Americas. Islantilla is also just 110km by motorway from the city of Seville and 118km from its airport (approximately one hour by motorway), 180km from Jerez airport and 50km from Faro airport (Portugal). Islantilla golf course is the most established in the Huelva region and features picturesque views over the Atlantic Ocean. The layout features three challenging and varied nines including play overlooking the beach and cliff tops, as well as lush parkland surrounded by pine trees. Islantilla hosted the 1995 Turespana Open won by Alex Cejka, as well as various Challenge Tour events including the APG of Spain.